Rise up against slavery with the latest single-player action-adventure game in the Assassin’s Creed franchise. Born a slave, Adewale was sold to a plantation owner at a young age. When pirates raided the plantation, Adewale escaped and found freedom as a pirate aboard the Jackdaw, where he became famed pirate Edward Kenway’s confidant and second-in-command. Now Adewale has become a trained Assassin and an illustrious member of the Brotherhood..
Port-au-Prince in 1735 is home to the most brutal slavery in the West Indies. Two thousand oppressed men, women, and children produce sugar, coffee, cotton, and indigo under the watch of six hundred French citizens, who live in constant apprehension of a violent rebellion. After being shipwrecked in what is now known as Haiti and left without weapons or a crew, Adewale starts to assist the locals in an effort to assemble a crew and steal a ship. The more he helps, however, the more he is drawn into the Maroon slave community. Forced to face his past, he sets out to free the slaves and bring death to their captors. Originally released as an add-on for Assassin’s Creed IV Black Flag, Adewale’s epic adventure is now available as its own stand-alone title; purchase of Assassin’s Creed IV Black Flag is not required. AN IMPOSING ASSASSIN – Once Edward Kenway’s second-in-command, now a seasoned Assassin trained by pirates, Adewale will face his past once and for all. As strong as ever, Adewale’s power resides in his imposing stature and his self-control. Along with his hidden blades, Adewale is a master of a new set of powerful weapons, including a booming blunderbuss and a deadly machete. FIGHT SLAVERY IN 18TH-CENTURY HAITI – Discover the secrets and horrors of Saint-Domingue and Port-au-Prince by land and by sea. Help rebuild the Maroon resistance in order to plant the seeds of emancipation among the slaves as you witness the brutal reality of slavery in the 18th century. Assassinate enemies and free the slaves in exotic Port-au-Prince. Deliver merciless justice in plantations. Experience the visceral brutality of two new weapons: the machete and the blunderbuss. ALL FEAR CAPTAIN ADEWALE – Command the Experto Crede, a fearsome brig that will strike terror in the hearts of all slave ship crews. Chase and plunder enemy vessels to upgrade the Experto Crede and take down the slavers in the Caribbean. © 2007–2014 Ubisoft Entertainment. All Rights Reserved. Assassin’s Creed, Black Flag, Uplay, Ubisoft, and the Ubisoft logo are trademarks of Ubisoft Entertainment in the US and/or other countries. Notice: Assassin’s Creed® IV Black Flag™ game not required to play. Already own Assassin’s Creed® IV Black Flag™ and want to play the Freedom Cry missions? 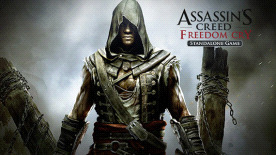 Check out Assassin’s Creed® IV Black Flag™ – Freedom Cry the DLC pack. Please note that if you already own Assassin’s Creed® IV Black Flag™ Gold Edition or Assassin’s Creed® IV Black Flag™ Season Pass, the Freedom Cry missions are already included in your game.